Ano has always been a happy soul with a permanently sunny disposition, and an inquisitive mind. She started Grade 1 with great enthusiasm but as the year progressed, we could see that she was battling academically, which in turn, affected her emotionally. As Grade 2 commenced, the well-established mainstream school she was in assured us they could accommodate her learning challenges, and so began the long and fruitless journey of additional academic support. When other children were outside chasing a ball, she would be indoors trying to make head or tail of the work in front of her. Homework was an absolute nightmare, taking anywhere from 2 to 3 hours. She was gradually losing her interest to learn. An avid singer, constantly making up songs, she seemed to lose her zeal to sing too. The house became quieter. Grade 3 brought us a gift in a teacher who both adored our little girl, and equally had an inquisitive approach to Ano’s learning difficulties. She was convinced that it wasn’t that she wasn’t smart, because Ano astounded her with her ability to solve complex issues but fail to complete simple sequences. At this phenomenal teacher’s request that we had our daughter tested by an educational psychologist. She was diagnosed with dyslexia. We researched numerous schools and discovered that Shelanti was the perfect fit for Ano…but there was a two-year waiting list. We were heart-broken. As we continued the academic journey into Grade 4, we could see Ano’s emotional health declining rapidly due to the strain of not being able to connect with what she was learning. As we were making the difficult decision of pulling her out of her then-current school with the mind of hiring a tutor while we tried to figure out what to do next, a miracle happened. A spot at Shelanti became available. The very first day that Ano attended the school for testing and orientation, she came home beaming and stated, “I never want to leave Shelanti!” She barely slept with excitement at the prospect of returning the next day. Deirdre’s recommendation was non-conventional but was obviously geared to make sure to make sure that Ano could learn, be challenged and grow. Communication with us was constant and clear. Deirdre and her team changed our family’s life. They went the extra mile to make sure that Ano got back on track academically but inadvertently, made her feel accepted and heard. She no longer dreaded school. Our beautiful child not only found her happy learning space at Shelanti, she found her lost song. Our home was filled with her vibrato again. We are so grateful for the Shelanti team. They have shown that professionalism accompanied by compassion is the key to building young minds effectively. 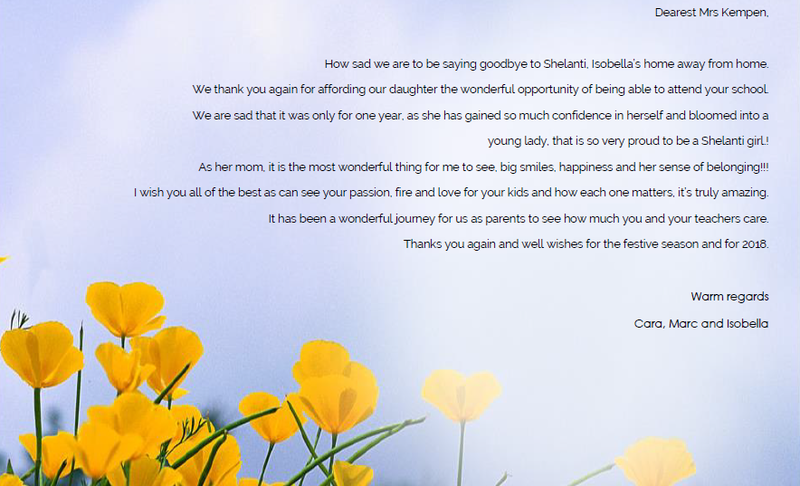 Let me take a moment again this year to acknowledge Shelanti and its staff for the great work they do. My wife and I had tears in our eyes as we read Daniel’s report this term. The metamorphosis that Shelanti has brought about in Daniel will never be forgotten and will always be appreciated. It’s always great to see good marks in your child’s report, but even more heart-warming are the remarks which show the growth Daniel is achieving under the guidance and care of the staff at Shelanti. Please can you also pass our appreciation onto Ms. Long. I though Ms. T was a once in a lifetime find, but believe we struck gold again in Ms. Long. Another rewarding year has come to an end for us at Shelanti which has seen Sasha grow academically and as an individual in leaps and bounds. She has become an independent, confident, self-assured little girl that is ready to take on the world. This is due to the guidance and love from you and your amazing staff. My little girl has blossomed in the time that she has been at Shelanti.Thanks to you and the awesome team of teachers and helpers you have working with you for taking such good care of our children. Our 10 year old daughter is beautifully different. She has had many challenges to overcome and we are so proud of her perseverance, her achievements and her growth. She would not be the child she is today had we not found her “happy place”, which is Shelanti Private School. Three years ago our sweet girl started at Shelanti. She was unsure of herself, struggled with most things she tackled and often became very down about her limitations. Thanks to the guidance of wonderful teachers, smaller classes, a passionate principal and loving staff our daughter has defied all odds and is thriving. We are so grateful to the staff at Shelanti for accepting her as she is and celebrating all her achievements , no matter how small. I too have learnt so much being part of the Shelanti family. I’ve learnt the importance of respect, tolerance, perseverance and celebrating all achievements. Our younger daughter joined Shelanti in the 2nd term of this year after a difficult start to Grade 1. The progress she has made at Shelanti in 3 terms is astonishing. Thank you to all the staff at Shelanti for guiding our girls to becoming confident, happy individuals. I would like to take the opportunity to thank Shelanti for all that they do for Noah. I realised the other day that without the awesome support we get from Shelanti Noah would be lost in main stream schooling, possibly dubbed unteachable and for this I will always be grateful. Shelanti allows him to be himself, with no judgement. They are able to see past the ‘issues’ and see the intelligent child hiding inside and slow but surely the inner person is coming out. He may never be the best reader or writer or the most social person, but at least at Shelanti he will get all the love and support he needs to blossom into the awesome human he is meant to be. I will always be grateful to all the staff at Shelanti for all the love, support and compassion our children receive there. When asked about her experience at Shelanti, Hunter had one word: FABULOUS! – and I tend to agree! From day one, the staff (admin & teachers) have been supportive – not only of Hunter, but of the whole family. This support & dedication has helped Hunter tremendously with her school work, but I think more importantly, with her attitude. She loves school, is interested in the work (we have long discussions about it) and has grown so much as a person. Where she would cringe at the thought of speaking to anyone new, and wasn’t exactly chatty at the best of times, she now engages with people readily. She’s also eager to get involved in new experiences, and has developed a real sense of responsibility & service above self – she wants to help & enjoys taking care of people. 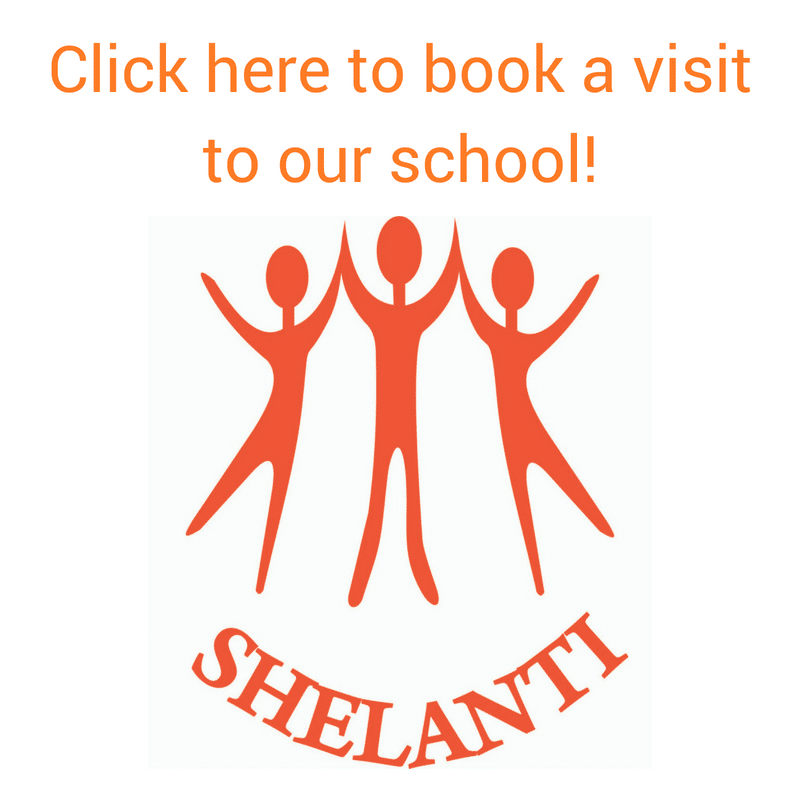 I would definitely recommend Shelanti – it’s a fantastic school run by fantastic people! Any chance you want to start a high school before 2017? For Matthew, the experience in the Grade 7 class was just what he needed to gear him for Grade 8 next year. The way of teaching is on a much more understandable and interesting level, and the individual attention he got when not understanding something has helped a lot. Matthew is so much more confident than what he was before. I would highly recommend Shelanti! I believe the time is right to give you some feedback on our first few months at Shelanti. Prior to Shelanti, we endured three long years of an unhappy child. Every day was a struggle and the impact on child, parents and family immense. I can now see that my boy is happy to come to school. I pointed out, when we joined Shelanti, that my wish was for Daniel to be happy. Thank you for being instrumental in getting us to this point. I realize our journey is far from over and more challenges lie ahead, but I wanted to recognize the achievement and progress made. I believe Daniel is thriving in the environment you have created. He is a delicate soul and all credit must go to all your staff for their understanding and handling of him. Obviously with Ms. T playing a huge role in this process. I must also take the time to acknowledge all your pupils. I did not think that children so kind, caring and all round well-mannered existed anymore. I especially want to mention the children at Aftercare as it is them I see most. Then last, but not least, thank you for creating this environment that has helped and will continue to help these vulnerable souls which can be so easily be broken. Well done and a big high-five to the whole of Shelanti, you have my respect and gratitude. I am the proud mom to Aidan Ramlal. He has shown consistent improvement in his school work over the past 2 years at Shelanti and finished his last grade with high scores. His achievements have not only been limited to academics; socially and emotionally he has also blossomed. When Aidan joined Shelanti in March 2017, he had difficulty reading. This affected so many areas of his life, including his confidence. I'm so thankful that Shelanti exists, without their approach and dedication my boy might still be struggling. Aidan was welcomed with open arms. 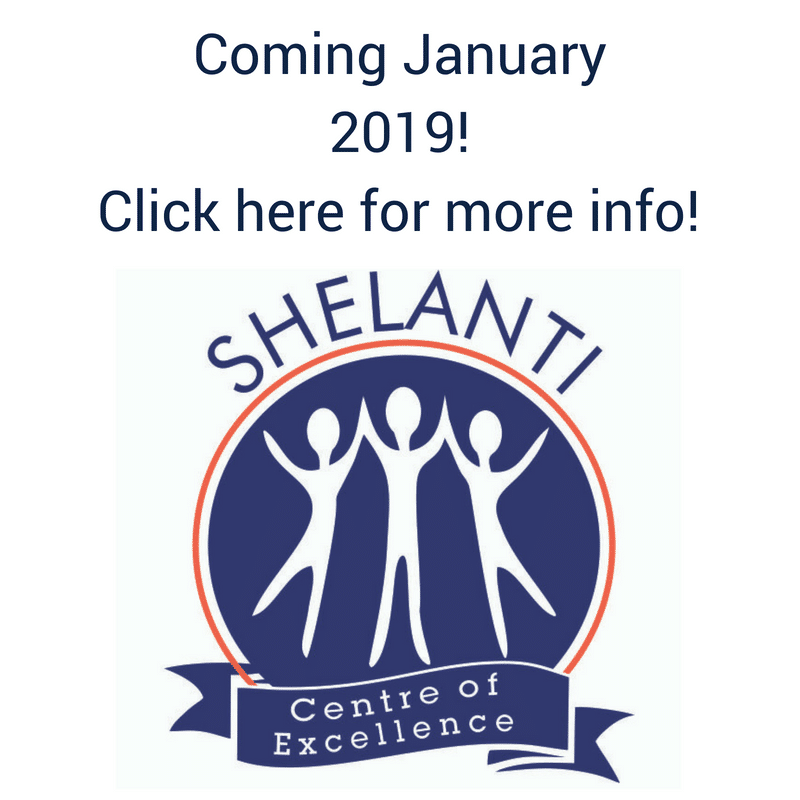 The process was efficient and smooth and in a very short time the dedicated teachers and staff at Shelanti found the root cause of my son's learning difficulties, something that no one else picked up even though tests were done and concerns were raised. Shelanti had the solution! On our journey so far, Aidan has become a confident reader and is growing into a well rounded individual. One of my first memories of this school is their Monday morning assembly, where the children are recognized as individuals and celebrated as such speaking value into each person regardless of any challenge they may be facing. It's more than just getting on track with academics, it's about knowing your worth.Aidan proudly displays his medals and certificates at home. My boy knows he can reach for the stars, he has persevered and overcome challenges. I can honestly say Aidan would not be where he is today without all the love and support from all at Shelanti. Well the first term is almost over so thought I’d let you know how Samuel was doing in high school. He has made a remarkable adjustment to high school, he is loving the sport & interactions with others .I can only thank you & your team of remarkable teachers again for preparing him & giving him the confidence to move on! The biggest change, apart from Parklands world of technology & eBooks, has been the adaption to fact that he is now completely responsible for all homework, organising his books & lesson timetable. This has taken some time but he has learnt amazing fast. High School has been a big change – they are treated as young adults & have to take responsibility. My best advice for your grade 6 & 7 class parents is to learn to take a step back & let the children learn to take responsibility for their own schedule, this will only help them when they get to high school where there is no spoon feeding! Sam is loving that he now has this responsibility & has blown us away by being so mature! Thank you all once again for the wonderful grounding you all provided us.....as you always say, it takes a village!